Hilton Head Island, SC — Professional Tennis Registry (PTR) presented its annual awards this week during the 2009 PTR International Tennis Symposium. The event, which includes 60-plus on court and classroom presentations, a tennis trade show and $25,000 Championships, is being held February 14-20, 2009, at Van der Meer Shipyard Racquet Club on Hilton Head Island, South Carolina. PTR established the Master Professional level of certification to recognize those individuals who have made significant contributions to the game of tennis throughout their careers. The designation of Master Professional is an important distinction in which PTR members must demonstrate their broad involvement in tennis over many years. They have shown growth in their knowledge of the game, a strong involvement in introducing tennis to their community, expertise in teaching and coaching and a commitment to developing professionally. PTR Master Professionals are a strong representative of the sport and display the highest standards in the tennis teaching profession. 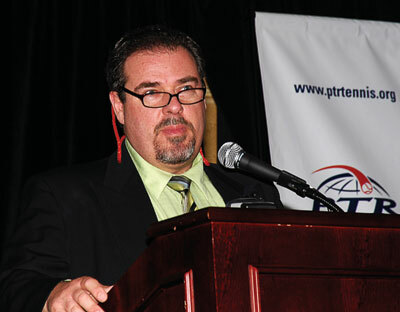 Jorge Capestany, of Hudsonville, Michigan, is the only person to earn PTR’s Master Professional status this year. Now, he is one of only a few Master Professionals with both PTR and USPTA (United States Professional Tennis Association). He is the Founder of www.tennisdrills.tv - a video based website that shows more than 700 tennis drills and tips. In his 27 years in the industry, Capestany has created and directed lesson programs that have generated over $1 million dollars in revenue annually. He has had articles published in several industry journals and has been a frequent speaker at the PTR International Symposium, the USPTA World Conference, USTA Tennis Teachers Conference and many others. Capestany has developed many nationally ranked juniors including three national champions. He has consulted many clubs and professionals on improving their tennis programs with innovative ideas that generate new interest in tennis. In 1998, Capestany wrote the booklet entitled Tennis Strategy, followed by his second book in 2008, Mental Toughness - Workbook for Tennis. Capestany serves as a Master Trainer on the Cardio Tennis Speakers Team and is a member of Wilson’s National Speakers Bureau. In recent years, Capestany has worked diligently to bring PTR members educational articles and DVDs.